John Adams was the second President of the United States (1797-1801). Considered to be a "passionate sage," many historians quote him in their manifold volumes. There is a problem, however, in many references to Adams' faith. Ignored, dismissed, and distorted by these writers, the context of Adams' life expediently conforms to secular writers' presuppositions and conclusions. These misrepresentations occur in lieu of the many references to God, Providence, and the Supreme Being found in his personal letters and other writings. 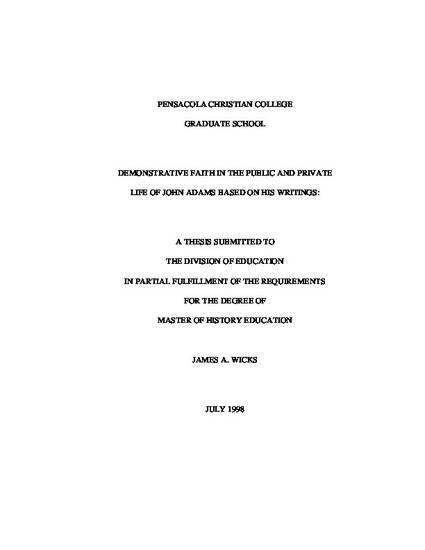 The purpose of this thesis was to chronicle elements of Adams' life related to his faith in public and private, removing popular notions that he was an atheist, agnostic or Deist. To accomplish this goal, his peculiar beliefs warranted examination. Areas related to Adams’ personal theology, private and public conduct, and views on the church and family were treated. Based on evidence derived from his own words, Adams’ faith aligned most closely with a biblically-based, Christian worldview.